Some of the cameras given to WRC division nine officers to help curb wildlife violations. Willis, who owns Custom Marine Fabrication, started calling members of the Neuse River chapter of CCA NC. 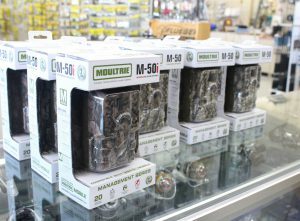 Within a few days Dr. Jay Singleton, Avery Corning and Willis had raised more than enough money to buy nine Moultrie 50i infrared cameras for the four officers in division nine who cover Craven, Carteret and Pamlico Counties. Since the division already had three of the cameras, the additional nine will enable each officer to place three “eyes” on creeks, hunting trails and boat ramps to catch violators. “We’ll put the cameras in spots we can’t be 24/7,” said Senior Officer Ingle. Those “spots,” he explained, could be on inland creeks to watch for illegal commercial fishing. They could photograph duck hunters shooting over baited water, watch a field for spotlighting deer after dark or they could monitor access areas for littering, vandalism and drug deals, Ingle said. Any moving object or person trips the infrared sensor and triggers a photograph, he said. The officers will periodically check the cameras, download the images and see whether any violations have been recorded. A photo of a boat number, license plate or a person can help tremendously in an investigation, added Master Officer David Midyette, another of the four officers in division nine. Cameras are extra items that the WRC’s statewide budget can’t usually afford after buying trucks and boats, Ingle said. “So some officers buy their own cameras. Donald wanted to help us crack down on violators so this is another way the community can get involved,” he added. While the tip line is the primary lead for wildlife misdeeds, the cameras will help considerably. Although the common infractions are misdemeanors, fines can add up, Midyette said. Besides $180 in court costs, an illegally harvested animal or fish is assigned a dollar value. He recalled a case where a fisherman had 380 fish over the limit. Each fish was valued at $12 so the total fine approached $5,000. “The tip line really works,” Midyette added. Because the chapter was so successful in fundraising, Willis called the manufacturer of “Plot Watcher” cameras and got a reduced price for a dozen of the time-lapse cameras that store photos in a video file. “You can watch an entire day in about five minutes,” Ingle said. The Neuse River chapter has raised over $5,000 to help agencies with their enforcement efforts. “We’re here to do what we can to help,” said Willis, who is also a statewide CCA NC vice-president. “I’m humbled by what our members have been able to do. 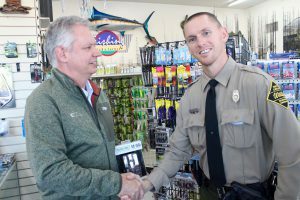 These cameras are to stop poaching, not stop anything legal,” he said, adding that several eastern Carolina fishing clubs also helped raise money for the donation. Helping agencies and individuals in need is not new for Willis. After Hurricane Florence devastated New Bern, Willis called Yeti and got 100 coolers donated so organizations along the coast distributing food could keep it cold while the power was out. 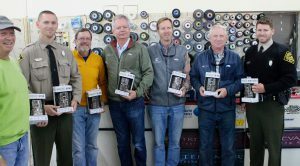 CCA NC Chairman Billy Byrd of Greenville praised the donations of the Neuse River chapter, saying the members have made a difference in the effort to protect the state’s wildlife and marine resources. “These are good guys,” he added.